Samsung Electronics extends Olympic sponsorship to 2028. December. 05, 2018 07:52. by Ji-Hyun Kim jhk85@donga.com. Samsung Electronics has extended its partnership with the International Olympic Committee (IOC) by eight years to 2028. South Korea’s tech giant said Tuesday that Koh Dong-jin, President and CEO of the IT& Mobile Communications Division at Samsung Electronics, and Tsunekazu Takeda, IOC Marketing Commission Chair, signed a sponsorship contract to extend their partnership through to 2028. 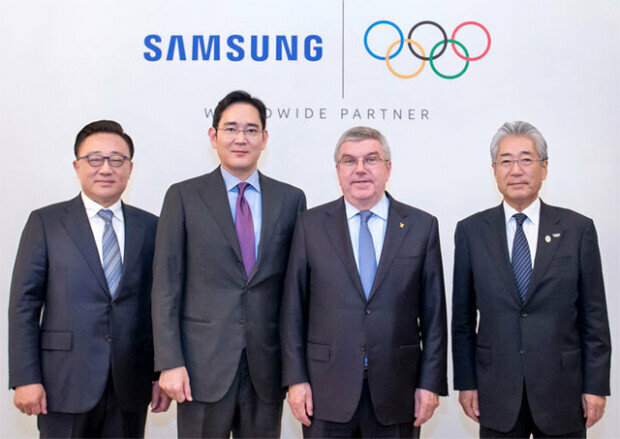 The signing ceremony was also attended by Samsung Electronics Vice Chairman Lee Jae-yong and IOC President Thomas Bach. Samsung will continue as the official Olympic partner in the wireless communications equipment and computing equipment category for the 2022 Beijing Winter Olympics, the 2024 Paris Summer Olympics, the 2026 Winter Olympics and the 2028 Los Angeles Olympics. Under the renewed partnership, the company will also promote the equipment’s 5G technology, Virtual Reality (VR), Augmented Reality (AR), and Artificial Intelligence (AI). The company’s decision to extend the sponsorship is seen as a move in line with the government’s plan to put together a joint bid for the 2032 Summer Olympics with North Korea. The two Koreas agreed to work together to make a joint bid for the 2032 Summer Olympics back in September in Pyongyang. Apparently, it would have been difficult for Vice Chairman Lee, who accompanied President Moon in his trip to the North, to disregard rising calls from South Korean politicians that Samsung should remain as the sponsor. “Samsung Electronics is currently the only South Korean firm in the list of top Olympic sponsors, so the company may have taken into account that if it decides to stop sponsoring, the spot will be replaced by Chinese companies such as Huawei,” an industry watcher said.